An update to Google Play Services enables manual Google Drive backup option on many Android handsets. Since Android 6.0, Android has had an online backup solution, allowing Android users back up and restore their device settings and app data from their Google Drive account. Android backups were running on top of Google Play Services; in other words, they were always part of Google Android as opposed to being part of Android Open Source. Unlike iOS with predictable iCloud backups and the manual “Backup now” option, Google’s backup solution behaved inconsistently at best. In our (extensive) tests, we discovered that the first backup would be only made automatically on the second day, while data for most applications would be backed up days, if not weeks after the initial backup. The ability to manually initiate a backup was sorely missing. Users experiencing the “Backup finished with result: Backup Cancelled” error had to run “bmgr backupnow appdata” before using “bmgr backupnow –all”. Forcing a cloud backup on Android handsets was widely inconsistent. Since Google Drive backups would only work automatically once the device was left on a charger and connected to a known Wi-Fi network, devices with broken USB ports would be unable to back up. The latest update to Google Play Services has finally rectified the issue by allowing users to manually back up their handsets to Google Drive. Since the new feature is a part of Google Play Services and not a feature of AOSP Android, the update is rolled out gradually to Android users through Google Play Store without the need of OEM or carrier approvals. We’ve tested multiple devices with Android 8.0, 8.1 and Android 9.0, all of which have already received the new feature. 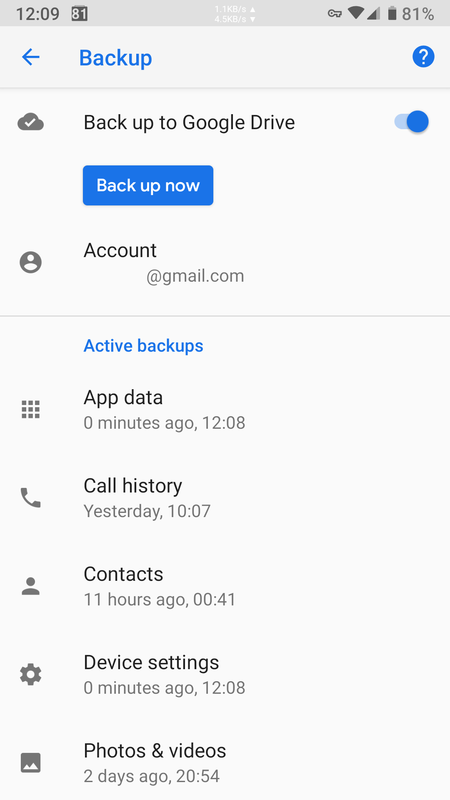 To back up your handset to Google Drive, open Settings > Backup and make sure the “Back up to Google Drive” feature is enabled, then tap the “Back up now” button. The manual backup option can be useful for investigations, allowing experts upload a fresh copy of device data to Google Drive without enabling Developer Settings and USB Debugging. This entry was posted on Monday, November 12th, 2018 at 4:23 pm	and is filed under General. You can follow any responses to this entry through the RSS 2.0 feed. Both comments and pings are currently closed.